Some industries require the power of compressed air, but also need air quality that is of utmost purity. An oil free air compressor does not utilize oil as a lubricant, so it has less air contamination than a conventional compressor. It can provide the cleaner air needed for applications in the food processing, medical, and technology industries. 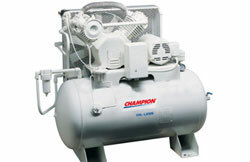 A&W Compressor has a wide selection of oil free compressors from top manufacturers, like Atlas Copco, Saylor-Beall, and Champion, to ensure you get the most durable and efficient compressors on the market. We also offer used and refurbished options to suit companies of most any budget. For more than 25 years, A&W Compressor has been offering knowledgeable and courteous service to Tennessee businesses, which has made us the trusted choice for compressor needs. We have the experience to fit your company with the oil free air compressor of just the right size, make, and model for your factory, auto body shop, or work environment. For more information on our top-brand compressors, or to schedule a compressor audit for your system, call or e-mail us today.